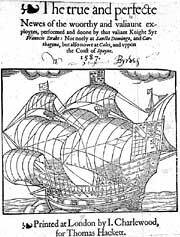 Title page of the 1587 account of Drake's voyage, The true and perfecte newes of the woorthy and valiaunt exploytes, performed and doone by the valiant knight Syr Frauncis Drake, not onely at Sancto Domingo, and Carthagena, but also nowe at Cales and uppon the coast of Spayne. Florida Photographic Collection. When Drake's men referred to the Spanish as the "cruel masters" of the cimarrons, they were not voicing antislavery sentiments so much as spreading propaganda against the Spanish. It was not long, however, before the famous privateer devised grand plans for an alliance with the cimarrons. By the late 1570s, Drake was actively promoting the idea of a New World alliance between black cimarrons, dispossessed Indians, and white Englishmen who would join together to overthrow Spanish tyranny from Peru to Mexico. Drake started out as a slaver himself, and his goals with this scheme could hardly be called altruistic. Most likely, he simply wanted to substitute British tyranny for Spanish. Nonetheless, he liberated slaves in Cartagena and Panama, and brought the cimarron cause before the Queen. Two other notable Elizabethans, Richard Hakluyt and Sir Walter Raleigh, eventually joined Drake in his vision. The three realized the start of their plans in 1586, when Drake liberated the black and Indian slaves in the Caribbean basin, later depositing them at Raleigh's colony in Roanoke. Unfortunately, the Roanoke colony vanished under mysterious circumstances (see next sidetrack). Meanwhile, the defeat of the Spanish Armada in 1588 rendered Drake's scheme less interesting to the British queen. Suddenly, Britain, not Spain, was set to become the dominant colonial power, and henceforth Britain would be more interested in enslaving Africans than in liberating them as revolutionary allies.